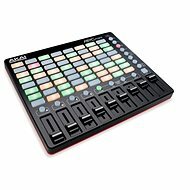 The perfectly compact Akai MPX16 sampler is one of the most innovative controllers of the current Akai Professional series. With Secure Digital, you can record virtually any sample in its memory, and then assign this sample to any of the sixteen backlit and speed sensitive pads. The MPX16 also includes a huge library of built-in standard audio samples that can be used instantly for live performances - whether you're in front of a crowd or at home. Bright blue backlit display and intuitive operation ensure a pleasant user experience under any lighting conditions. It includes a headphone output with a 3.5mm connector and two symmetrical 6.3mm outputs. There is also a built-in stereo microphone for instant recording. You can power your device via USB from your computer or via an external adapter. The Akai MPX16 gives musicians a handy tool for quick and convenient access to a virtually unlimited number of sounds. Record any samples using the Secure Digital card. 16 speed and pressure-sensitive paddles . USB MIDI and standard MIDI inputs and outputs. Manage computer MIDI software and other MIDI devices. Drag-and-drop soundtrack editor for Mac and Win downloads . Built-in library of popular sounds and samples. Additional Akai Pro loop libraries to download from the manufacturer's website. Tune your own samples, add reverb and store them for subsequent use. 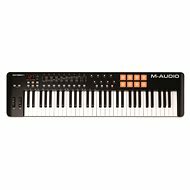 For shipping to other EU countries visit this page AKAI Pro MPX16. Für Versand nach Deutschland, besuchen Sie bitte AKAI Pro MPX16. Chcete doručit zboží do Česka? Prohlédněte si AKAI Pro MPX16. Chcete doručiť tovar na Slovensko? 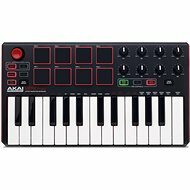 Prezrite si AKAI Pro MPX16. Für Versand nach Österreich, besuchen Sie bitte AKAI Pro MPX16. Magyarországra történő kiszállításért tekintse meg ezt a termékoldalt: AKAI Pro MPX16.